On Thursday night after 4 months on strike the coal miners of Rio Turbio won the reinstatement of 171 workers. The victory is a small but important blow against the conservative government's wave of layoffs against state and public sector workers. The miners have a long history of struggle which has pitted them against both the conservative government of Mauricio Macri, and the state government which remains under the control of family members of former president Cristina Kirchner. Cristina Kirchner's own Secretary of Security was previously, in 1994, on assignment to infiltrate the miners under the pretense of offering medical aid. Cristina's older sister Alicia Kirchner is the current governor of the province and has had security forces collaborate with the national government around the strike. The miners have consistently been compelled to defend their right to work and a decent livelihood against both the right wing Cambiemos coalition and against the Peronist opposition. The mine and the town built up around it carry a long history of struggle. In 2004 fourteen miners were killed after a fire in the conveyor belt led to the collapse of support walls and the release of toxic gases. The disaster led to eventual state intervention, but the mine has never been definitively nationalized. It is held instead in a state controlled private corporation which is attempting to declare a crisis so as to justify the layoffs. The miners accuse the government of aiming to reduce production and avoid investment so as to justify the future total privatization of the mine. Nearly five hundred workers were laid off recently, of whom the 171 were those who chose to reject the compensation offer and fight for their right to keep their jobs. The union declared a strike which has been ongoing for 4 months, shutting down production which will only resume now that the reincorporation of the 171 has been secured. The government attempted to break the strike by mobilizing 200 police to re-open the mine, but the mobilization of the miners and the community stopped them. While the miners were able to lead significant mobilizations, the key was to break their isolation in the far south and fight to place their struggle on the national agenda. On April 6th a group of miners undertook a journey of almost three thousand kilometers from Rio Turbio to the capital of Buenos Aires. Upon arrival they held a protest in front of the Congress and later that night installed a tent after an earlier attempt to do so had met police repression. Miners, unions and the organized left went about building the protests and ensuring that their struggle could not be ignored. The miners refused to keep their protest isolated to only their individual struggle and instead chose to build alliances and challenge the broader austerity agenda of the government. A joint protest was organized together with healthcare workers who were laid off at a major hospital in Buenos Aires. They marched together with Nora Cortinas, one of the key activists from the long struggle of the mothers of the disappeared against the military dictatorship. They were invited to speak to students at the University of Buenos Aires, Argentina's largest public university, where they received the solidarity and support of student activists. 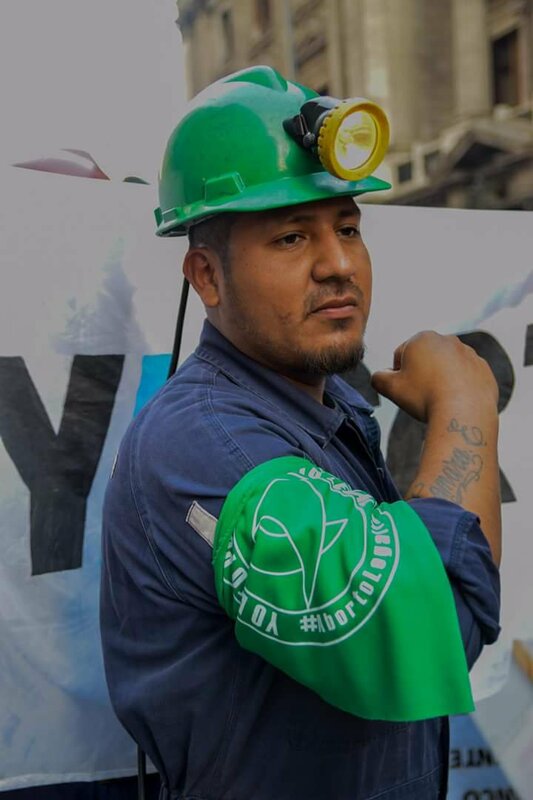 The miners also joined in support of a protest for abortion rights that was held while they were encamped outside the Congress, many of them wearing the green bandanas that have become a symbol of the struggle to legalize abortion in Argentina. After returning they built upon the relationships constructed in Buenos Aires to send video messages and statements of support to other worker's struggles across Argentina. Participants in the caravan remarked upon the impact which solidarity from other workers and students had upon them. One remarked how "The truth is that they are coming for all of us and we must unify all the struggles wherever they are." What remains from the struggle is a greater sense of worker's unity and the possibility of beating the government by uniting the diverse struggles of workers, students and women. As the Argentine government prepares to negotiate an agreement with the IMF, this kind of unity in struggle will be absolutely vital to resist the coming attacks. Key to building this unity in defense of the miners was the significant presence of an organized left across the worker's movement, student movement and women's movement. The ability of left organizations to unite the many affected sectors into a social force capable of shutting down the country will be essential to consolidating this small victory and preparing to stop the disastrous austerity measures which are to come.